In comic book news, Peter Parker is returning as Spider-Man in April. For the past year, long time arch nemesis Doctor Octopus took over Spidey's brain and had adventures as the self-named "Superior Spider-Man". As much as I love Peter Parker, I feel like his return is still too soon. It was only a little over a year with Doc Ock as Spider-Man, I feel like to make it more "permanent", that should be the status quo longer. Still, I am happy to see Peter Parker again, since he is such a great, fun character. 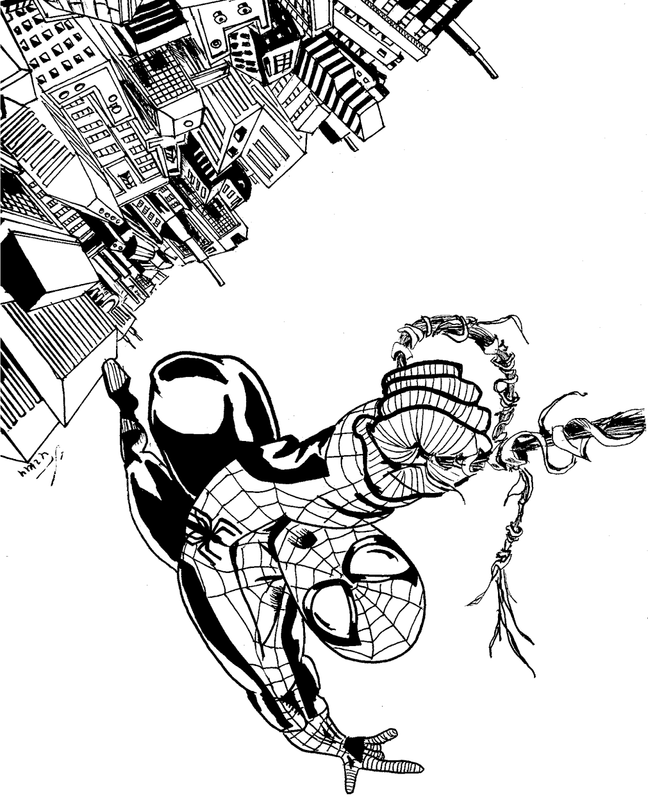 The Spider-Man was done in a Papermate medium size Flair pen, including all of the shading. The city landscape is done with a G2 gel pen. As I have said before, I personally hate drawing buildings because it is surprisingly difficult to follow the perspective lines. If you look closely, my buildings are not perfectly aligned with perspective, but as a whole it looks good.